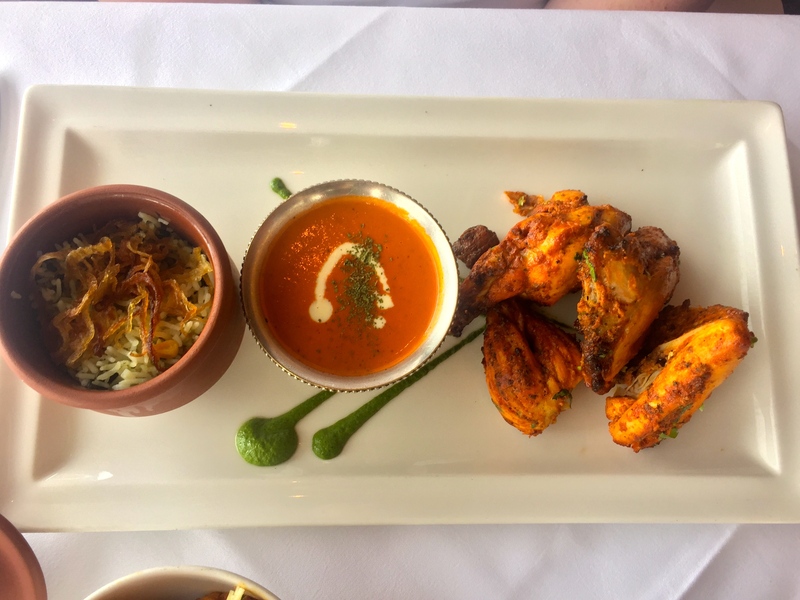 On Easter Monday, I decided to take advantage of the lovely weather and take the train up to Greystones for an early dinner in Chakra, one of the restaurants in the Jaipur family. We’d only been here once before about 6 months ago, and even though I took photos, it was winter so it was too dark to do the beautiful food justice. It’s safe to say that Indian food is my favourite food. I never get sick of it, and would happily eat it every day. I ate in Jaipur once about 9 years ago when it was on George’s Street, and was equally impressed at the time. Alas, it is no more but Chakra and the other restaurants in the group live on. We arrived at 5pm, the first people there, and we were seated at the window with a lovely partial view of the sea. We were also presented with some poppodoms and chutneys and a free glass of prosecco, while we looked at the menu. I’m not sure what warranted such lovely treatment, but we were pleasantly surprised! I gobbled up the poppadoms as I was starving! Other people started to arrive so we didn’t feel so self-conscious. Last time Mr Cooksalot had the chicken biryani and he loved it so much he was tempted to go for it again but I encouraged him to try something else. We decided to share the kebab platter, a selection of different marinated and grilled meats and accompanying sauces, as our waiter ensured us it would be enough to share. 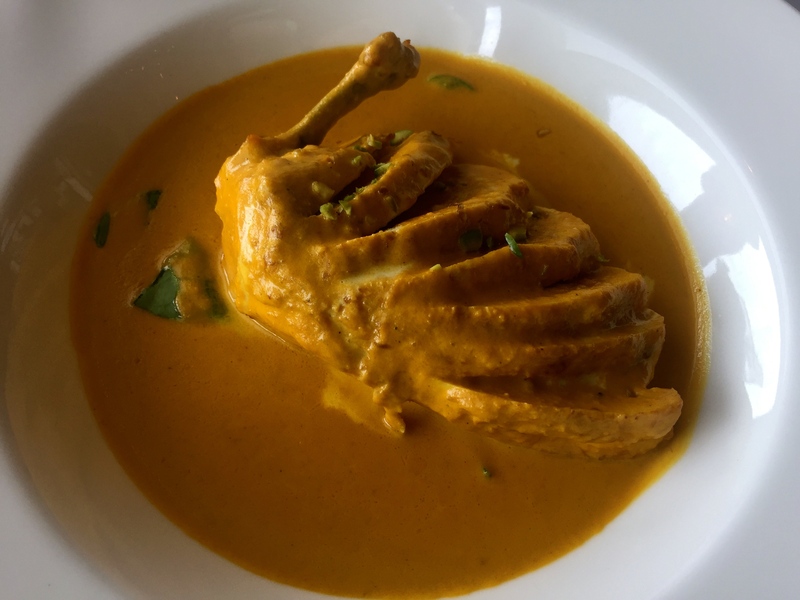 I ordered the Murgh Chandan Korma, because it sounded intriguing with smoked pistachios and a stuffed chicken breast. Mr Cooksalot ordered the Tandoori Chicken, which came with pulao rice included. Mine didn’t come with rice, so I ordered plain steamed basmati. I also ordered the aloo gobhi to share. We were going all out! While we sipped our lovely dry prosecco and discussed what visiting India would be like, we were presented with an amuse bouche, which was a welcome surprise because it was beautifully presented and did I mention I was starving? All I’d eaten that day was a bowl of porridge at midday and some easter chocolate! Anyway the chef had created a delightful spiced pea soup, with some Irish back pudding and a seared scallop. You might think that black pudding wouldn’t work with Indian food, but actually when you think about it, it’s heavily spiced, or at least should be, so it works really well. The soup was silky and light, but perfectly seasoned. 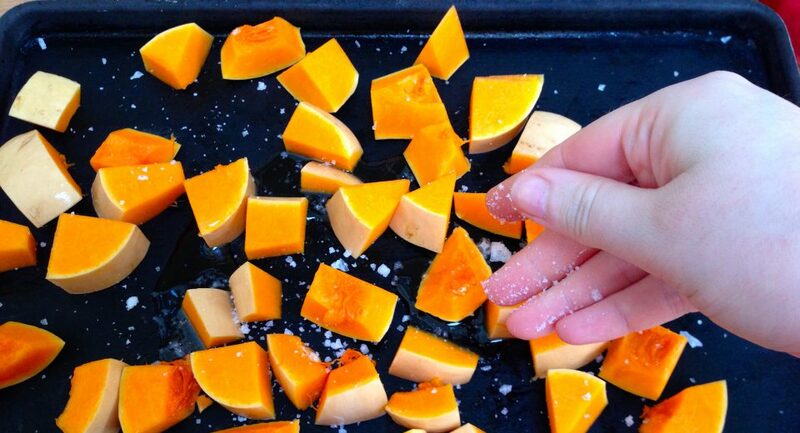 Plenty of aromatic spices without being hot. I was trying to get a nice photo and by the time I tucked in, Mr Cooksalot was nearly finished his, exclaiming it bloody delicious! And it really was delicious. The perfect start to our meal without being too filling. 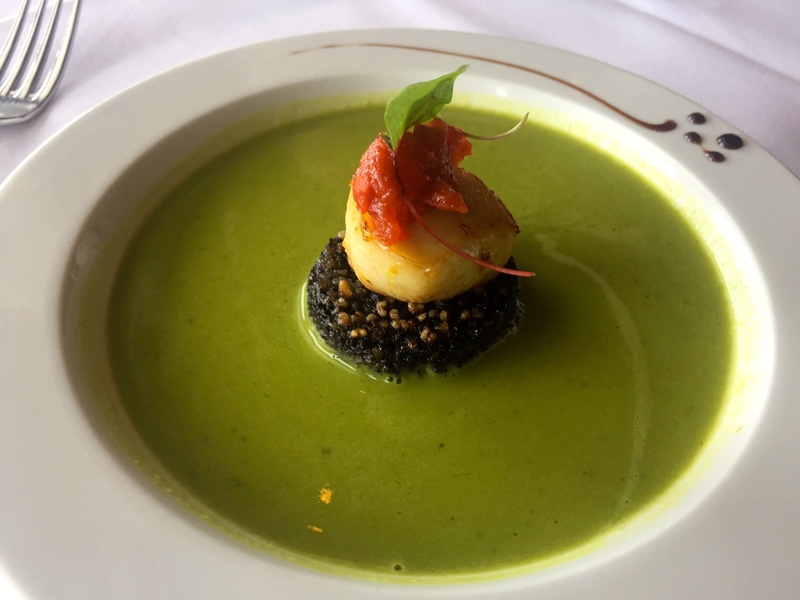 The surprise amuse bouche – spicy pea soup topped with great quality black pudding and a perfectly cooked scallop. Our starter arrived soon after. If ever there was an Instagrammable plate of food, this was it. 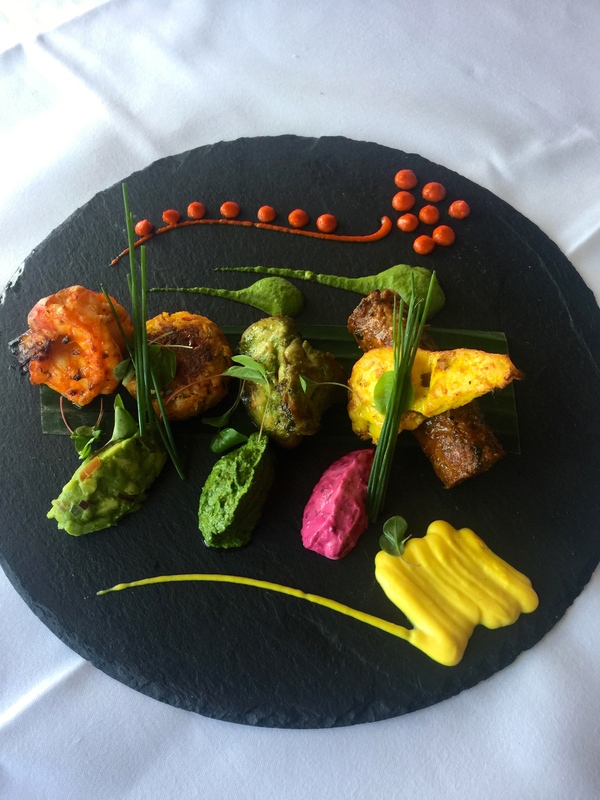 Served on a large round slate, the food formed a beautiful kaleidoscope of colours – with as much variety as possible without being too over the top. Look, I’m not normally a big fan of food on slates. But this food was so vibrant that I’ll make an exception! We had chicken breast, minced lamb, large king prawn and a potato cake, each with their own complimentary sauce opposite. Mr Cooksalot gets understandably annoyed with me if I take too long with the photos so I snapped as many as I could before tucking in. Each kebab was perfectly cooked, tender and delicate but with plenty of spice. To be honest, I could probably have polished the whole thing off myself, as it wasn’t heavy or filling, but we happily shared it this time. When our mains arrived, they didn’t disappoint. My chicken breast was super delicate. I don’t know how exactly, but it was stuffed with a super light chicken mousse and presented as a whole chicken breast, complete with the little bone intact. The centre was almost sausage like in texture but it worked brilliantly. The sauce was rich and creamy, and the smoked pistachios set it apart from your average korma. It was quite rich, and I knew I wanted to leave room for dessert so I left about half of it and asked for a doggie bag. Trust me, this is not the kind of food you want to leave behind! I had also ordered the coeliac bread, which is essentially a chickpea pancake style bread that is gluten-free. It’s quite flavoursome, and great for mopping up the sauce. Before I ordered everything, and especially before I tried the surprise amuse bouche, I double checked that it was all gluten-free. The waiters were very happy to double-check with the chef, but if you are a celiac, I’d be extra cautious, as I’m pretty sure the black pudding had barley in it. This isn’t a criticism at all, because everyone was very conscientious. It didn’t matter to me and I felt perfectly fine afterwards, but better safe than sorry if you actually react to gluten. Mr Cooksalot’s chicken tikka was beautifully presented too. The meat was charred and served on the bone. The tikka masala sauce was served in its own little pot, as was the pulao rice. He was deeply satisfied with it all, and I made sure to taste it too. It was excellent. Almost like a deconstructed chicken biryani, without being pretentious. 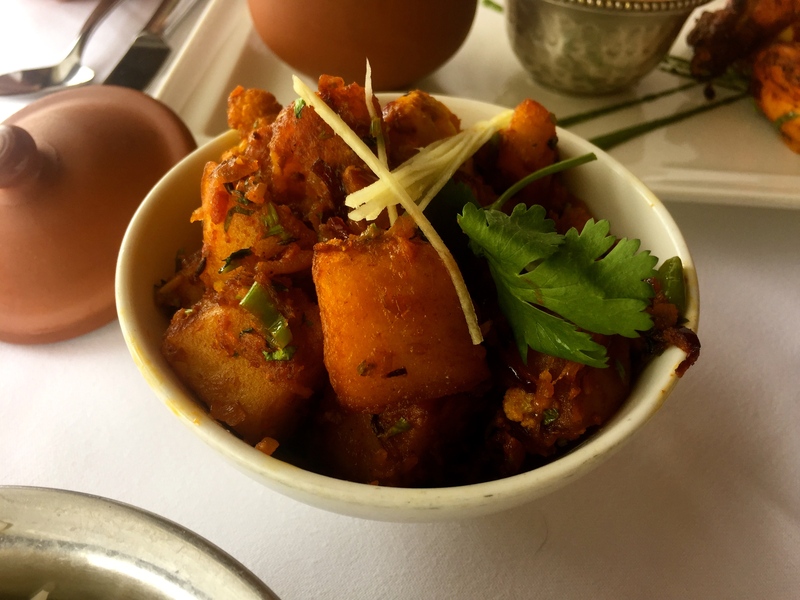 Our aloo gobhi was excellent as well, and we polished it off quickly – or at least Mr Cooksalot did, and I took what I could get. I have a feeling you could happily eat a vegan meal here without missing meat or animal products in the slightest. I ordered a glass of Albarino that went very well with the perfumed food. 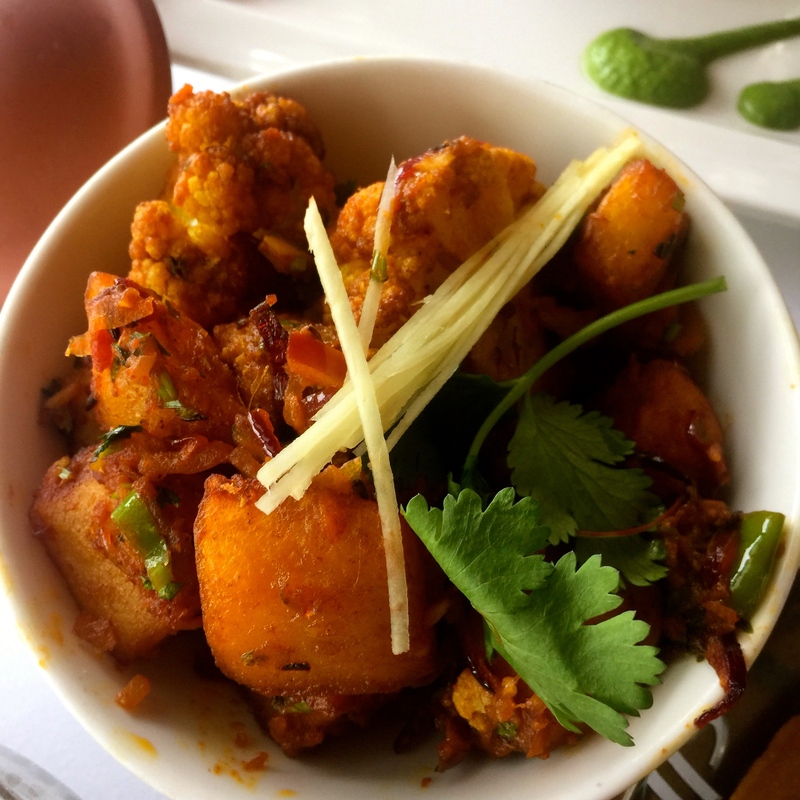 The Aloo Gobhi, a potato and cauliflower side dish. Perfect if you love curried potatoes and vegetables. The portion wasn’t particularly big but was enough for us to share considering all the other things we had to eat. Finally we knew we wanted to have dessert, and even if you’re not normally a dessert person, I urge you try them out here. I debated getting a caramel pudding but was pretty sure from the description that it had flour in it. In the end I ordered the pistachio kulfi again and was glad I did, as it was served slightly differently to the last time. Desserts don’t really come more naturally colourful that this! 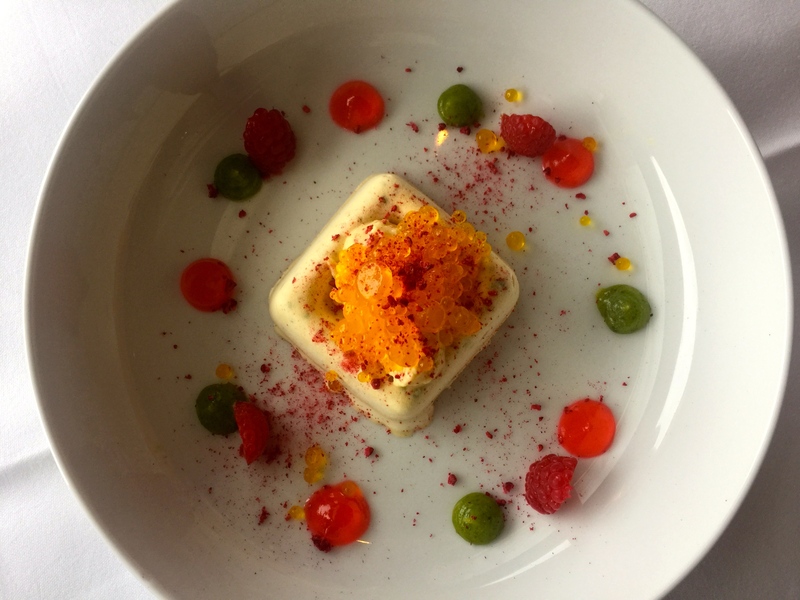 It came out topped with saffron scented pearls of jelly, and dusted with raspberry flavoured crumbs, fresh raspberries and a green sauce to garnish. It was so beautiful I almost didn’t want to touch it. 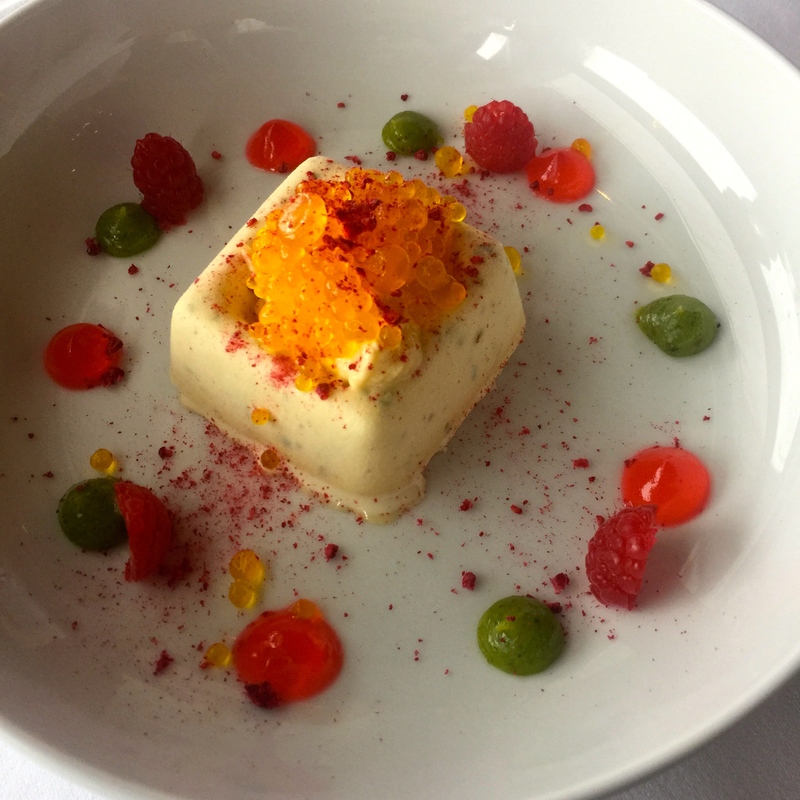 The kulfi is creamy and filled with pistachios and the jelly pearls are delicate and melt instantly in your mouth. The whole dessert was superb. All those gentle spices are excellent for digestion. Even though we ate a lot and much of it was very rich and indulgent, we didn’t feel like we had overdone it at all. Usually after such a superb meal, you might feel over full or uncomfortable, but we didn’t. Those spices really complement each other and work to make the meal more digestible. 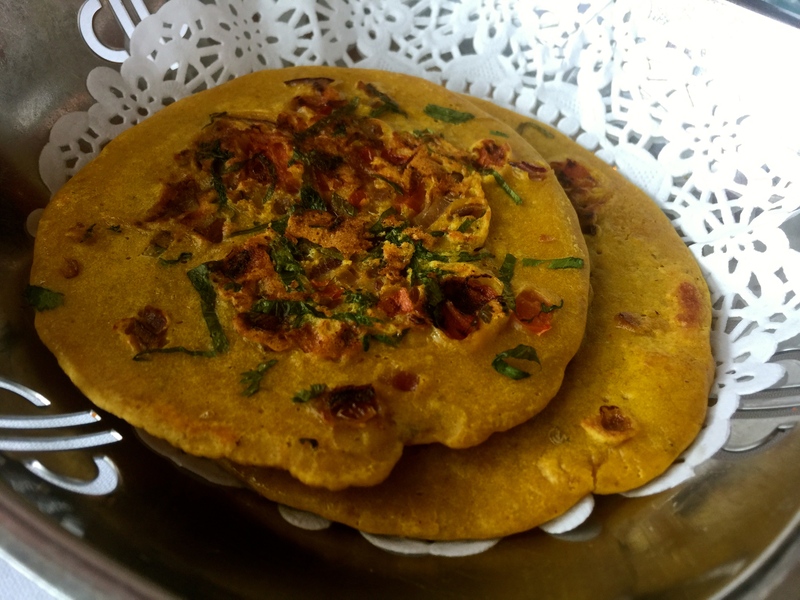 Indian food is not all about chillies and curries of course! 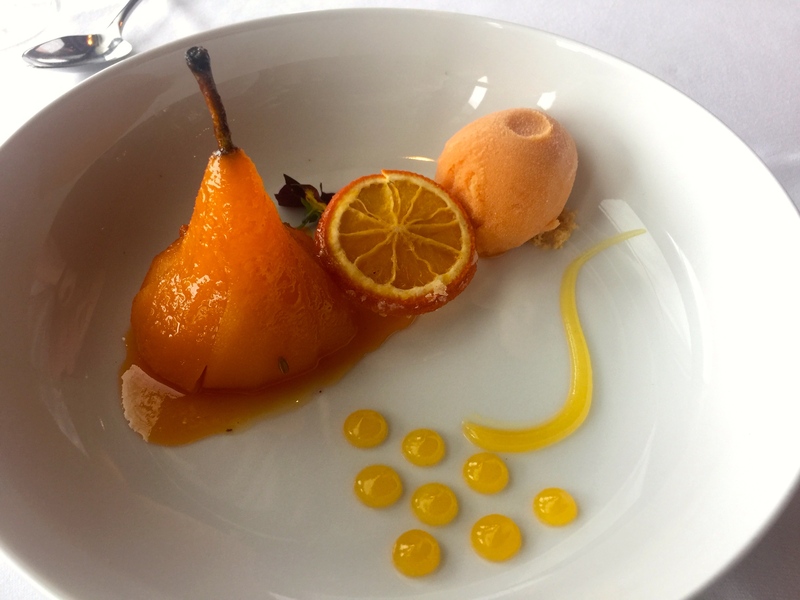 Mr Cooksalot ordered the poached pear with blood orange sorbet and he adored it! Again, everything was subtly spiced and really added to the fruit flavours without being overly perfumed. Now I’m not sure why, but the chef came out to greet us at the end of our meal. It was a great gesture, and we felt very honoured. All of the staff are perfectly attentive without being too intrusive. It seems like the ideal goal restaurant, excellent quality food, but relaxed enough to bring the whole family. We saw tables with young children and older generations, as well as other people on romantic dates. We would have happily stayed on for a drink but we had a train to catch so we rushed down to the train station across the road and caught the last train of the evening. Chakra do takeaways too but sadly not delivery, so I think I will have to make a pit stop soon on my way home as a treat! The food was really exceptional, and a far cry from your average Indian restaurant in Ireland. 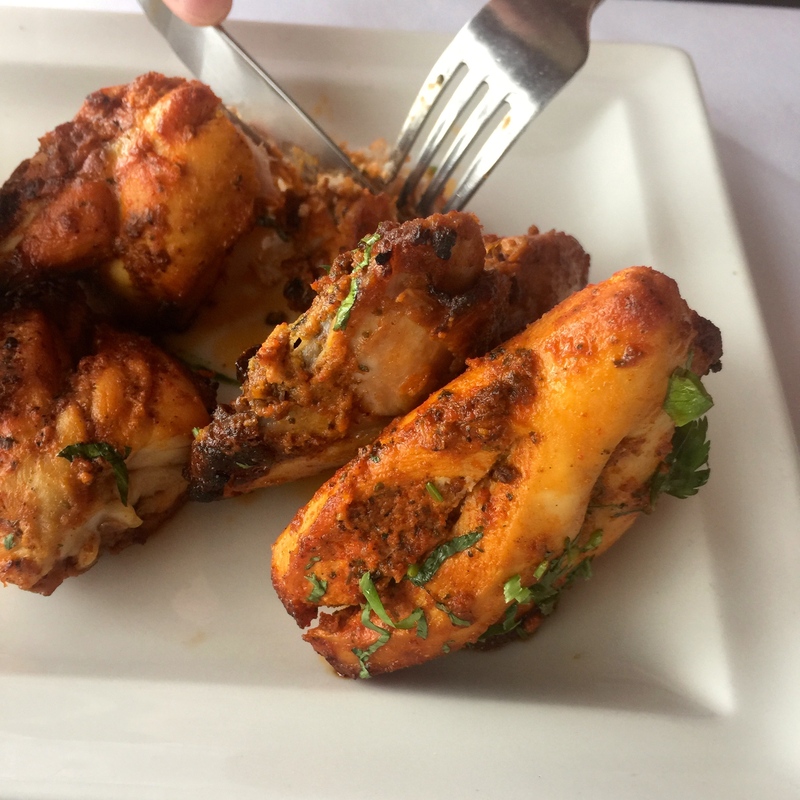 One thing I really love is that they use Irish ingredients where possible, and their meats are good quality, which is something you don’t always get in Indian restaurants here, unfortunately. © Jessie Stuart and Ms. Cooksalot, 2015. Unauthorized use and/or duplication of this material without express and written permission from this blog’s author and/or owner is strictly prohibited. Excerpts and links may be used, provided that full and clear credit is given to Jessie Stuart and Ms. Cooksalot with appropriate and specific direction to the original content.